➤ 8 Alarms and backup battery- This electric calendar clock(cord drive) has 8 alarms(3 medication reminders included) and a CR1220 battery inside for data retention in case of power failure or unplugged. ➤ Auto-dimmer& 8 languages- With a dimmer inside to auto-adjust brightness of display area when time changes. English, French, German, Dutch, Welsh, Italian, Spanish, or Polish can be set to system language. 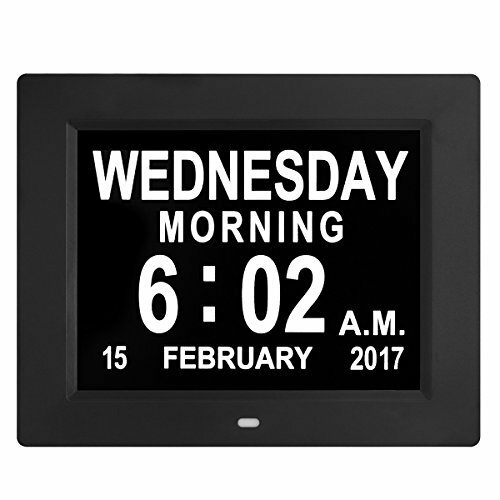 ➤ A Perfect Gift for the elderly- Kaylocheer large led clock is designed particularly for elderly who's confusing about time,day and date. This clock also support viewing photo and videos, besides, it can be normally used for 5 years. ➤ Why highly recommend- 1. Easy to setup 2. Durable quality up to 5 years 3.Unconditional free return and refund in 30 days with no reason ask. 4. LIFETIME WARRANTY 5.Timely professional customer support whenever you have before or after order. If you have any questions about this product by Kaylocheer, contact us by completing and submitting the form below. If you are looking for a specif part number, please include it with your message.